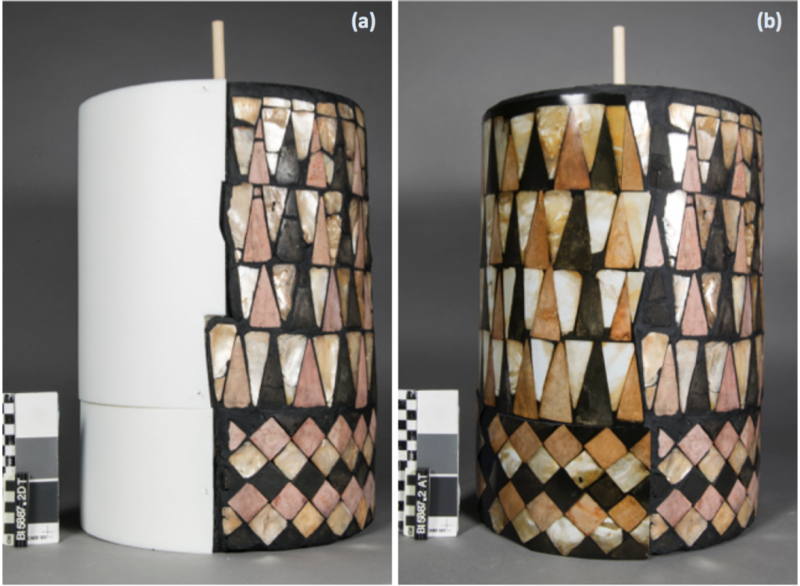 As a last installment of the mosaic column from Tell al-Ubaid in Iraq, we are pleased to announce the treatment and remounting of the 4,200(+) year-old shell, pink limestone, and black shale tesserae is complete (Figure 1)! After a number of years in collection storage, the recently conserved column is now in the Middle East Gallery, and ready for visitors when the exhibit opens this Saturday, April 21, 2018. The treatment process was a dynamic collaborative project, involving a team of seven conservators to clean, repair and re-mount hundreds of triangular and diamond shaped tesserae over the span of 18 months. Figure 1: The previous column support (left), with all tesserae deconstructed from each section. Only mounting materials, such as plaster ground and reconstructions, remain on the supports. (Right) The newly mounted tesserae on Ethafoam column supports. The tesserae were originally mounted at the archaeological site in 1919 – 1924 on four hollow cylindrical sections made of wire mesh and burlap. The tesserae were imbedded in a thick layer of plaster, and the resulting weight on a somewhat flexible base eventually became a structural problem. In addition, each column section had a large area of plaster reconstruction to continue the mosaic design around the column. For a memory refresher of the previous condition and treatment protocol, visit our blog posts, column blog 1 and column blog 2. 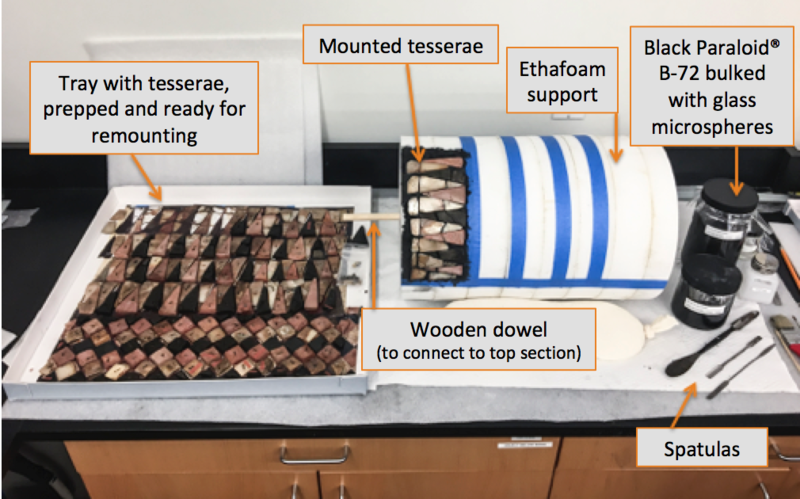 After months of cleaning every tessera and adhering many fragments back together, the tesserae were mounted onto a new support made from solid Ethafoam, a chemically stable and dense foam (Figure 2). Each new column section support was reconstructed to the same measurements as the wire mesh and burlap supports. The previous use of plaster proved too rigid and heavy in the original mounting system, causing many cracks to develop in the plaster and tesserae to loosen over time. For these reasons, plaster was not used again, and the tesserae were mounted to the Ethafoam supports with an acrylic paste (Paraloid® B-72 (ethyl methacrylate (70%) and methyl acrylate (30%) copolymer) in acetone bulked with glass microspheres) toned black with dry pigments. This is lighter in weight compared to plaster, and compatible with the shell and stone materials. The black acrylic paste was made to resemble bitumen, a pine resin material used by the Mesopotamians to originally mount the tesserae to the c. 3rd Millennium BCE column. Figure 2: Mounting process of column section #2. The cleaned and repaired tesserae are mounted to the Ethafoam cylindrical supports with Paraloid® B-72 (ethyl methacrylate (70%) and methyl acrylate (30%) copolymer) in acetone bulked with glass microspheres and toned black with dry pigments to mimic bitumen. Spatulas were used to spread the acrylic resin on the support and tesserae were imbedded into the mixture. All four column sections stack and connect with an internal wooden dowel system. To accommodate the large areas that were once plaster restorations, our Photo Studio printed high resolution, archival images of the tesserae, which were custom scaled and fit to each column section (Figure 3). The digital photo fills integrate a complete mosaic design to give the appearance of a fully mosaicked column (Figure 4). This is a great example of how recent technological advancements help conservators with approaches to treatment and display options. 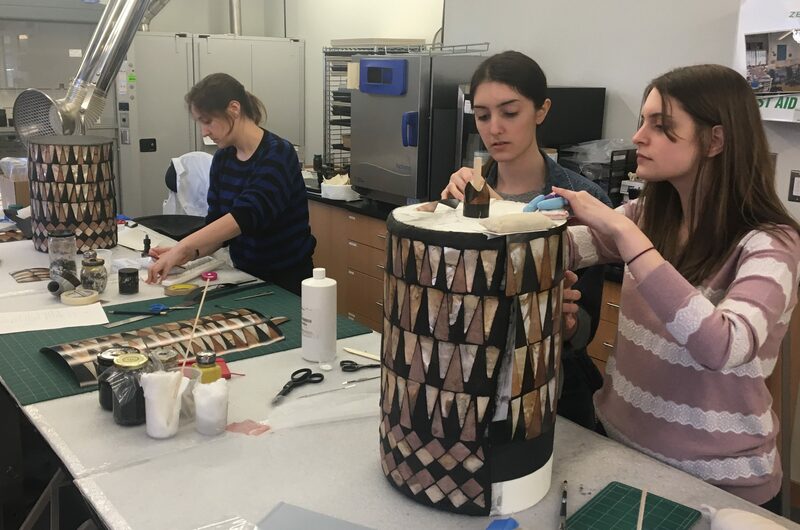 Figure 3: (From left), Conservation Interns Tessa Young, Alyssa Rina and Jennifer Mikes installing digital photo fills to the top and bottom mosaic column sections. Figure 4: (a): Column section #2, after remounting tesserae. The locations with previous plaster reconstructions are padded with Volara (closed-cell polyethylene foam). (b): Column section #2 after pinning archival photo fill into place over the Volara. The mosaic column, and over 1,500 objects await your visit in the Middle East Galleries (Figure 5)! 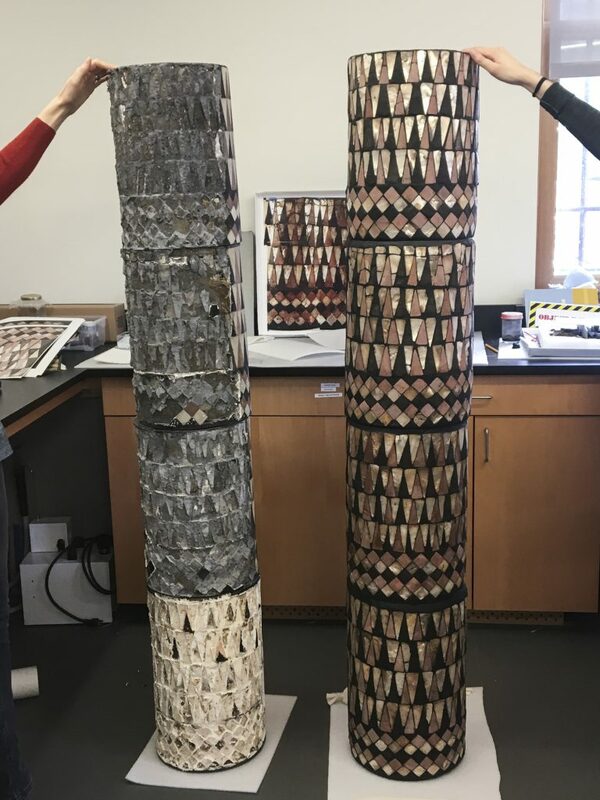 To our visitors in the Artifact Lab who witnessed our many, many hours of treating these column sections, we thank you for your brilliant questions, comments and curiosity about the tesserae and our conservation process during our Open Window Sessions. You will find the assembled column has transformed into an impressive and complete piece, and we hope you enjoy it as much as we do! 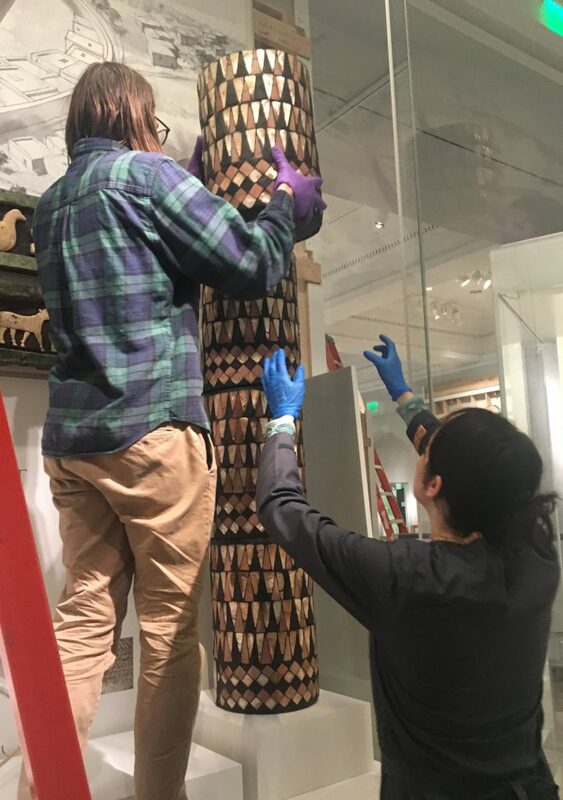 Figure 5: Bob Thurlow (Special Projects Manager) and Marci Jefcoat Burton (Conservation Curriculum Intern) installing the four mosaic column sections in the Middle Eastern Gallery.